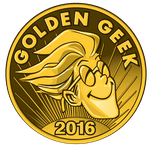 Subject: Officially Nominated for the 2016 Golden Geek for Best Boardgame Podcast! Well, thanks to each of you - WE DID IT! 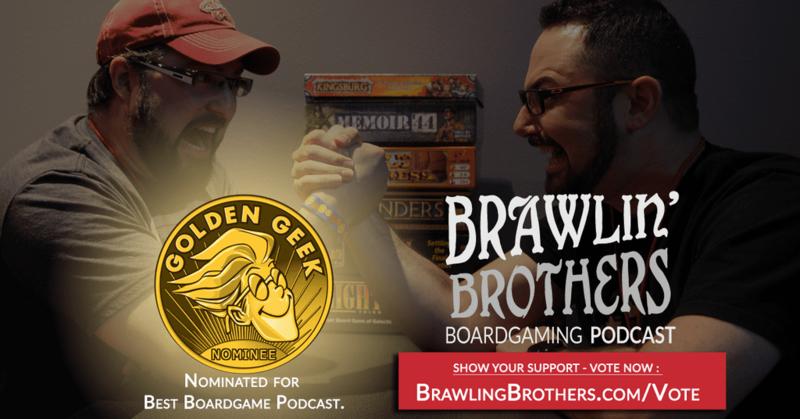 We were officially nominated for the 2016 Golden Geek for Best Boardgame Podcast! We need all of you to vote - and remember that "1" is the best score you can give. "You're number one, you're number one..."
Done! You guys are #1! There were some great podcast nominated this year, and I believe the results are going to be tight. I hope my vote helps push you guys over the top and you end of winning. "I like it when they say bumper to bumper." Done and done. You guys are amazing! Already done on day one. This task is now complete! Reminder: Voting concludes on March 6th! Don't leave us hanging, Brawlers! We need EVERYONE to vote! Remember - don't vote for shows you don't want to win. A 10 is a better score than nothing at all. Well, #1 and #2 went pretty much as expected. Congrats to Shut Up and Sit Down and Rahdo... We love both of those productions and couldn't be happier for them! The #3 spot was definately up for grabs, and I don't think that anyone had a good guess as to who would take it. I had really hoped we'd see our name on that list, but alas... It was not meant to be. Congrats to Geoff and his crew... Ludology is a great show that is unique and provides a look at our hobby from an angle that noone else does. Next year will be our year... If we can sustain 1/2 of the growth in the next year that we've seen in the last 6 months, we will soon RULE THE WORLD!!!! (Ok, thats a bunch of BS - but it was fun). Thank you all for your love and support. We make this show for YOU! Winner - Shut Up & Sit Down: The Podcast! Congrats to the Winner, the Runners-up and of course ALL of the nominees..especially our own Brawlin' Brothers! You guys are growing at an extreme rate! No doubt we will see you on that list soon! Well done Brandon and Josh! 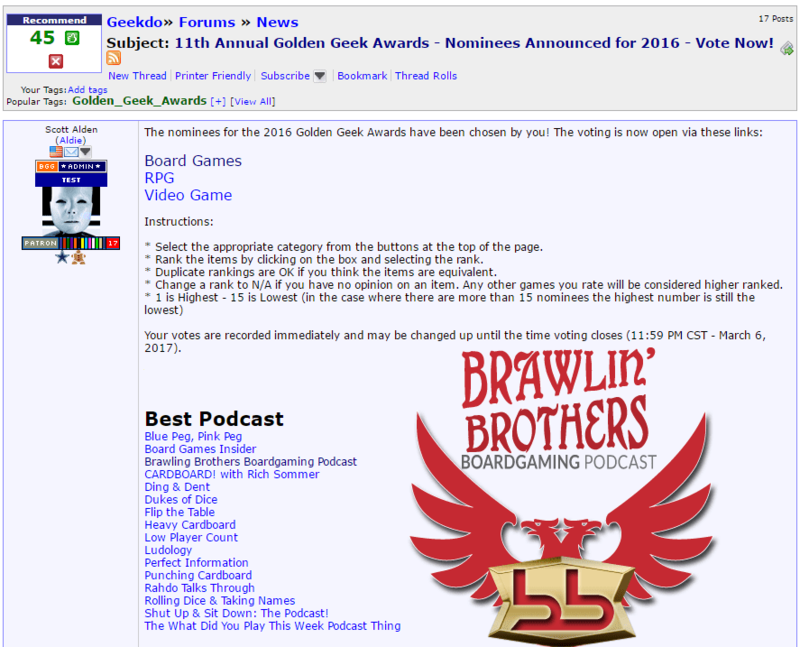 The most surprising thing about the 2017 awards is just how quickly the BGG awards are competing with the Origins awards for being the gaming awards that demonstrate the worst taste. SUSD - They have a large following for their wonderful videos, I get it, but their Podcast is poorly produced, the content is sub par. They aren't nearly as funny impromptu as they are when scripted. They come off as elitist or bored pretty much the entire show. Seriously? THEY won? Rahdo talks through won second place? Its like a 2 hour ADHD stream of consciousness monolog about upcoming games and one hour of talking about his personal history/life/beliefs. Its the closest thing there is to a gaming news podcast and cult of personality all in one package. No editing, dry and no soul. From my critical perspective, these choices just seem tasteless. Brawling Brother, BPPP, Flip the Table, and RDTN. Each of these four shows are more informative, and entertaining. I won't even share my thoughts on Scythe. Anyhow, I wanted to find a place to vent and express my feelings that BB really was robbed. Please keep up the good work so I can feel like you get short changed next year too. Rahdo talks through won second place? Its like a 2 hour ADHD stream of consciousness monolog about upcoming games and one hour of talking about his personal history/life/beliefs. Its the closest thing there is to a gaming news podcast and cult of personality all in one package. No editing and no soul. I expected SUSD to win and Rahdo to get 2nd... The crossover that they get from a MASSIVE following on youtube is HUGE. Regardless of their production quality or content, its hard to compete with crossover of 45k youtube subscribers (plus the typical BGG Podcast listener). 3rd place was really up for grabs in our eyes... I expected we were (at least) in contention, and figured BPPP would win it (great friends of ours and they have built an incredible show). Ludology surprised me because, while I really love their show, I expect that their content is more more niche than all the other shows combined. The show has grown at a phenominal rate - Last year at this time we were averaging about 75 downloads a day.... The last 3 months we have averaged 10x that, plus massive spikes on release days. The popularity of Brawling Brothers is undeniable... The future is bright and I'm quite certain in the coming years we will be in the front running for awards like this. Even so, it still hurts to see the things you love and believe in not given the honors you feel they deserve. You guys have earned my praise. Too bad their isn't a micro badge for that. SUSD's videos are great. The podcast is uninformative and uninteresting and borders on snarky at times. I don't subscribe. I don't understand the popularity of rahdo at all. His videos are terrible and his podcast is unlistenable. Nothing against the guy. He seems like the nicest guy in the world, but it just isn't for me. I don't subscribe. Ludology is a good podcast. They talk about stuff no one else does. Informative and entertaining. I don't subscribe, but I listen to episodes that sound interesting. Keep on keeping on, Brawlin' Bros. Your time in the spotlight will come.